Ice cream is a popular dessert option at our house year round, but the frequency with which it’s eaten ramps up in summer. In fact, one of our favorite things about summer is visiting our local ice cream shops and we have a few favorites that we’ve discovered in the years since we moved to our town. This year things got even better when another shop opened up within walking distance of our house. I’ve already convinced myself that the 10 minute walk each way is sufficient to negate any and all calories consumed at the shop. So, I guess maybe the ice cream shop within walking distance is actually not such a good thing (especially if I’m hoping to still fit into my clothes this fall)…ask me again at the end of the summer! We don’t always head out when we’re craving ice cream. Since buying my ice cream maker a few years ago, I’ve made a lot of ice cream at home. It’s much cheaper and I love being able to customize flavors to suit our preferences and cravings! This brown sugar vanilla ice cream ranks among my all-time favorites while Shane is a big fan of the french vanilla cookie dough (the photos aren’t the best, but both flavors are really fabulous!). I’ve found David Lebovitz’s The Perfect Scoop an invaluable resource for tips on homemade ice cream and lots of great recipes so I definitely recommend it if you’re looking for a place to start. I actually shared this chocolate-peanut butter ice cream on my blog almost 2 years ago, back when the only readers I had were Shane and my mom 🙂 It’s a good one though and since summer is just about here I figured I’d update the picture and write a new post. This is a great recipe if you’re new to making ice cream at home as it doesn’t require you to whip up a custard – you simply throw everything except the peanut butter in a pan, bring the mixture to a boil, whisk in the peanut butter, chill then churn. Easy! The resulting ice cream is thick and creamy and the chocolate and peanut butter pair beautifully, with neither being too dominant. The chocolate/peanut butter combo is a favorite and this is just another fabulous way to enjoy it! In a large pan, whisk to combine the half and half, cocoa powder, sugar and salt. Heat the mixture, whisking frequently, until it comes to a full, rolling boil. You’ll know you’re there when the mixture starts to foam up. Remove the pan from the heat and add the peanut butter, whisking to blend thoroughly. Refrigerate the mixture to chill thoroughly, then freeze it in your ice cream maker according to the manufacturer’s instructions. 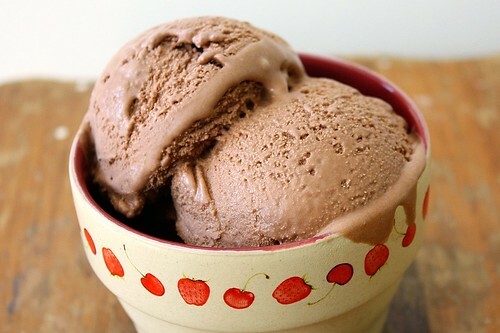 25 Responses to "Chocolate-Peanut Butter Ice Cream"
wow this must taste awesome! Yum, yum! You can’t go wrong with peanut butter and chocolate. I’ve made this one before; it’s super-good and so easy. I love the dish it’s in. 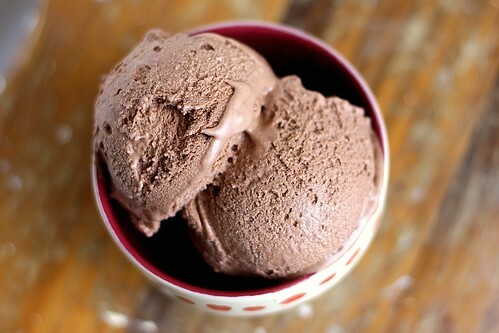 This ice cream looks fantastic. I like that it doesn’t have any egg yolks. I don’t like to use up so many eggs haha. This looks delicious and might be one I could veganize. I’ve been looking for a recipe like that. Thanks – beautiful photos! the perfect scoop is so amazing- I’ve loved every recipe I tried from it! This looks so great. I love the combination of peanut butter and chocolate. The Perfect Scoop is such a great book! Thanks for the book recommendation and the amazing ice cream recipe. I love ice cream and feel so much better about eating it when I make it at home. That’s my favorite ice cream flavor…so sad I defrosted my ice cream maker tub! Oh yumm! I wish I had some of this! You can tell that summer is just around the corner, with all these yummy ice cream posts! Love the combo! ah oh! This is one deadly treat!! I would want to consume it all!! I need to find a good ice cream shop that’s about three miles away….then the walk there and back would definitely negate the calories! I love the chocolate-peanut butter flavor you’ve got here. Chocolate and peanut butter is such a perfect combination. This looks so yummy! 🙂 So glad I finally broke down and got an ice cream maker (after TWD burnt sugar)! I also got David’s book and am churning his Cinnamon ice cream now (highly recommended)! 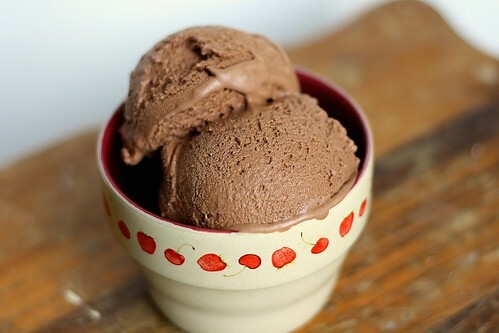 This looks wonderful – I love how homemade ice cream is so much more “tasty”! I agree – it’s a great inspirational book – and glad you are enjoying your maker as well this summer! I’ve made this recipe and it’s SO good. Of course, now I’m craving it! I added the peanut butter patties to it and they were delicious. i made this recently too and was going to blog about it 🙂 i’ll wait a little while before posting. i love DL’s recipes! This summer I’m at a hotel that’s a 25 min walk each way from a candy / ice cream shop – perfect way to negate the ice cream eating guilt 🙂 And I adore chocolate and peanut butter together, so this looks fantastic! I made this ice cream last summer and I was shocked by a) how easy it was to make and b) how tasty it was! I just loved it. It’s been in the back of my mind, but reading your post really makes me want to make this again SOON.